The conference of the Sri Sathya Seva Dal comprising about 3000 members from all over India, met at Prasanthi Nilayam in the fall of 1972, only a few days prior to Dasara. Bhagavan received them as His prema putras, children fostered with (His) love! He wanted them to lead the resurgence of spiritual yearning among the youth. He encouraged them to develop faith in Sai, for each dal or petal can be alive and active, colorful and fragrant, only if it is attached to the torus. He directed them to practise the teachings of Sai and to be shining examples revealing their worth to the world. The lesson that one must learn from the yajna that lasted seven Dasara days is, Baba said, that, "Yajna alone gives Jaya" (sacrifice alone can confer glory). During the festival, on 17th October, Bhagavan announced that the auditorium at Prasanthi Nilayam - the most beautiful and spiritually vibrating hall in the East, with soul-inspiring sculptures and paintings - would be called Poornachandra, in memory of the late Poonamchand Kamani whose dream it was, which was realized through Baba's grace. One incident which occurred on the 23rd of November deserves to be highlighted in the Sai chronicle. About sixty devotees had arrived from far-away Gauhati, the capital city of Assam. They had travelled in a special railway coach for seven days before they reached Bangalore, and they had before them another week-long ordeal to get back home. Baba appreciated their devotion and gave them darsan and a short spiritual discourse at the prayer hall. He filled their hands with the precious gift of vibhuti. 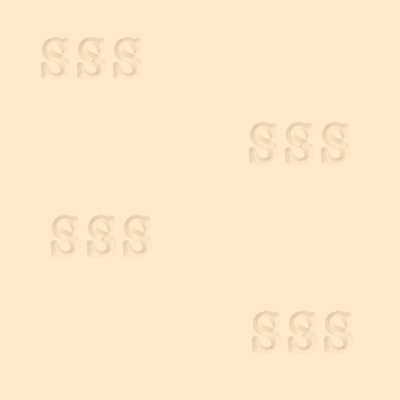 He saw in the group a girl named Lakhi and he gave her vibhuti a second time, saying, "This, for the cat." The cat was Minkie, whom she had rescued from the city drain on a rainy day and brought home to keep warmed and fed. The kitten was not, however, welcomed by her elder sister who was a nurse in the biggest hospital in the city, but who could not stand cats. She blamed Lakhi for bringing the horrid thing and keeping it as a pet. One night when a few guests had arrived for dinner, the cat stole into the kitchen and ran off with a bite of fish. This enraged the lady so much that all her bellicose adjectives exploded in one burst at Lakhi's face. Lakhi could bear it no longer. She caught Minkie by the neck and spanked her severely with a longish stick. The poor thing yelled in pain. Suddenly, every picture of Sai Baba in the house - there were sixteen of them hanging with garlands after the Thursday bhajans - fell on the floor! The guests ran out of the house into the open courtyard, for they were sure that an earthquake had struck. But the lady noticed that only the pictures of Baba had dropped; all others were intact on the walls! It was then that she realized that Baba had given a sign to save the cat. She shouted to her sister, "Lakhi! stop! stop! Don't kill it! Baba is angry with us!" Lakhi placed Minkie on the table. She was in tears, and her sister, too, was sobbing. The cat tried to allay her pain by shaking in quick quivers. The guest had come back by now and they too witnessed the struggle of the cat to regain her poise. Lo and behold! When Minkie shook herself, puffs of fragrant vibhuti emerged from her fur and fell thick on the table! The fragrance announced that Bhagavan had blessed the cat. Six months later, on 23rd November, when Lakhi was present with many other devotees from Assam at the Prasanthi Nilayam prayer hall, Bhagavan, in His infinite compassion, remembered Minkie, the unwelcome cat, and sent to her His most valuable prasad. He instantly detects every denial of love and warns us when we miss our way. His hand reaches beyond the horizons of space and the chronologies of time. He teaches us, by example, to wish well for every form of life, be it man, beast, bird or plant. His love has no limit, for He is in all. Christmas 1972 was a festival during which Baba further elaborated the concept of Cosmic Christ. He traced the expansion of the Christ consciousness right up to Christ's declaration, 'I and my Father are One' and said that this was the acme of Advaithic (non-dualistic) experience. Baba said, in addition, "This is the truth of Jesus and also of every one of you. You are all, fundamentally, the Cosmic Christ." the birds, beasts, insects and plants, all contemplate. They can give enough instruction and inspiration to you." In January Baba was at Guindy, Madras, to unveil a monumental pillar at the temple where He had installed an image of Sri Baba of Shirdi, 25 years earlier. On the sides at the base of this pillar are inscribed Bhagavan's directives for the regeneration of man. Since the biggest shed (there were only three then) could not hold even half the number of pilgrims who came to Prasanthi Nilayam (abode of eternal peace) for Shivarathri (night of Shiva), Bhagavan quietly motored to the Bandipur forest on the border of Karnataka. The warden of the jungle brought news that there was a quiet spot on the Kakkara Halla stream, with a patch of dry sand. So Baba, and the few who were chosen by Him, drove in a van into the forest. A herd of twelve elephants had been spotted minutes earlier, but had discreetly made itself scarce. As Bhagavan alighted from the van He stood and broke a stalk of jungle grass, about an inch and a half long, and another about half its length, and bound them together in the middle with a bit of stalk skin. It became a cross. He was about to drop it into Hislop's open palm but He desisted. "No! I must give you another," He said. Holding the grass cross before His face, He blew upon it. This became a wooden cross having the same dimensions, with a small silver icon of Jesus on it. 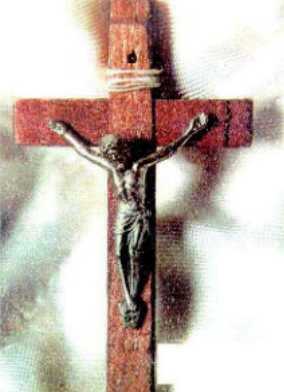 "This is the wooden cross on which Jesus was crucified; this is the correct image of Jesus on the cross," He said, and gave it to Hislop who was kneeling, and in tears. (Later he got the wood examined, and was informed that it was at least twenty centuries old. He had the silver icon photographed and the photographs enlarged. He was surprised to note that there were marks of sweat on the brow and signs of froth at the corners of the mouth. It had all the signs of pain heroically borne). (See: Reference to White Man's Burden for this story by Hislop). Then Baba moved down the bank of the stream and sat on the sand with those who had accompanied Him, including the warden, guards and a few tribals attracted by these mysterious happenings in their part of the world. From the sand that was heaped as a raised bed, Baba created a translucent lingam, five inches long and four inches across, seated on an eight-inch-high base. "Straight from Kailas where it was being worshipped. See the sandal paste, the kumkum dot, the bilva leaf," He said. He transformed the sand into an icon of Shirdi Sai Baba, an idol of Laksmî (goddess of happiness and eternal companion of Nârâyana) and another of Durgâ (wife of Lord Shiva). And, finally, He created before the wonder-struck gathering, a casket which was full to the brim with Amrith (nectar)-sweet beyond imagination and with a divine fragrance. Even the tribals who had huddled around him received their share of prasad from His hands. The lingam was at Brindavan the next day and Baba allowed a large number of devotees to participate in the puja. I could recite the Rudra-adhyaya from the Vedas, in praise of Shiva, during the ritual ablution of the lingam. And I can still recall the thrill of my pouring on the lingam the holy water of the Ganges, transported by Baba with a wave of His hand from the very source of the river in the Himalayas. "Punjab has earned a reputation for valour. It should make a name for spiritual courage, which comes from faith in God... Pray to God asking Him to endow you with an intellect that does not waver and a mind that is balanced." Baba left Mogha for Simla by car. Forty thousand people had gathered on the ridge, many from the suburbs and the homesteads in the villages lying amidst the mountains. Simla had not seen such a massive assembly in living memory. Baba told them that though man had probed outer space and explored the deep, he had yet to learn to be at peace on earth. Man wants peace and happiness but he does not know how to acquire them. He runs after petty desires and short-lived pleasures. "There is a surfeit of preachers but a shortage of practitioners," Baba said. He advised and directed the people to concentrate on fundamental gains rather than superficial ones. He gave two discourses the next day - one on the ridge and the other at the grounds of 'Woodville', His residence. On another day Bhagavan paid a brief visit to Kufri and Phagu, past the snow-covered road. 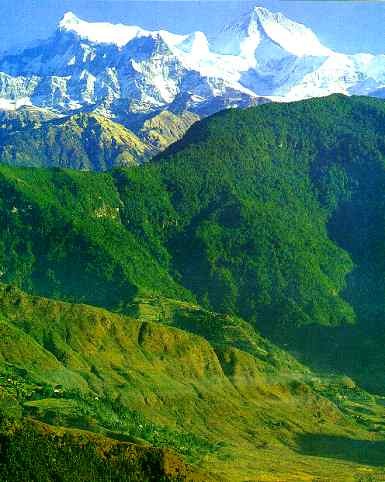 A magnificent view of the silver-robed Himalayan peaks can be had from these hamlets. Though the snow was knee-deep, about 200 men and women followed Him. Baba picked up a little snow and changed it into a pair of gold earrings for a tribal girl. He blessed many with vibhuti, and an old lady with a ring. The visit of the Lord to the Himachal Pradesh marked a turning point in the lives of many. Groups of seekers from many of its towns and villages continue flowing into Prasanthi Nilayam to be in His presence for a few days. At Delhi, a pandal (an outdoor auditorium) which could seat more than two hundred thousand people, was found inadequate on some days. Bhagavan was present there during morning and evening Bhajans, moving amidst the thousands and showering grace on the sick in the form of curative vibhuthi. He also addressed a select gathering of ministers, academicians and others at Vigyan Bhavan. He spoke to them on the urgency of moral regeneration and of the role of the individual in the process. Bhagavan was very liberal with His time and conferred the fortune of personal conversation and counsel on hundreds who yearned for the chance. Next, Bhagavan motored to Jaipur, instead of going by air as had been earlier planned, thus allowing thousands to have Darsan as He drove by. At Jaipur, Bhagavan laid the foundation stone for the Sri Sathya Sai College for women and for a temple. He also addressed a gathering of 50.000 on the need for selfless service. From the 28th to the 30th March Baba was in Bombay, making a short visit to Poona on the 28th. He addressed a packed assembly of two lakh Bombayites at the Vallabhai stadium. Next, He flew by a chartered plane to Rajkot, in Gujarat, to bless the Raj Kumar College during its centenary celebrations and to open the Digvijaya Singh wing of the college buildings to commemorate the late Jam Saheb of Nawanagar. "The youth need colleges, for there they can learn to live and move with others of their own age, coming from different social and economic backgrounds. They can learn tolerance and cooperation and realize their talents and virtues," He told the gathering. On the Telugu new year day Baba was at Hyderabad for the inauguration of the holy 'Sivam' mandir. "Let the new year bring you Ananda. You can get it by serving the poor, the disabled, and those who earn their livelihood by strenuous physical labor," He said. Baba blessed the juveniles at the remand home in Hyderabad. "I like children. I take great care of them, insisting on discipline, reverence to parents, moderate food and allotment of time to study, prayer and meditation. I also recommend some form of service," He said. The main topic on which Baba focussed His discourses in the summer school was the Moha Mudgara [***] or Bhaja Govindam of Sankaracharya. In July, Baba was again in Bombay for visits to the central school for the deaf and the Sathya Sai Service Centre at Koliwada, a hamlet of fishermen which had been adopted by the Seva Samithi. He also attended a Bal Vikas programme featuring the children of the mill workers at Worli. The Dasara message was one of "sacrifice, detachment and renunciation" through positive and constructive activity. "Do every deed as an act of worship to Him; let every thought be a longing for Him; make every word a hymn of thanksgiving for His benevolence." Bhagavan has been repeating in His discourses, the Vedic exhortation to the youth to "revere your parents as God," for reverence is fast disappearing in Indian families. He emphasized that the home is the earliest and best school, where one's most enduring skills and habits are imbibed. It is the place where one's heart should always be, wherever one might physically wander. We love our country because the tombs of our fathers, the temples of our God, the fields which have fed us and the rivers we have bathed in, all exist therein. To demonstrate the value of reverence, Baba inaugurated the birthday festival by His visit to the mausoleum of the parents, where His 'sisters and brothers' joined Him along with their children and grand children. Every act of His is a lesson to us. The year 1974 witnessed a miraculous event in Rajahmundry, a small town on the bank of the Godavari river. Rajahmundry is a town that revives nostalgic memories of ancient glories, sheltering many religions and cultural institutions, and entering contemporary history once every twelve years when lakhs of pilgrims from all over India travel thither for a holy bath in the river. Bhagavan willed that an All India Conference of office bearers of the Sathya Sai organizations be held there for three days. Over 6000 delegates attended the conference and the gurus who taught Bal Vikas children comprised an additional 750 persons. 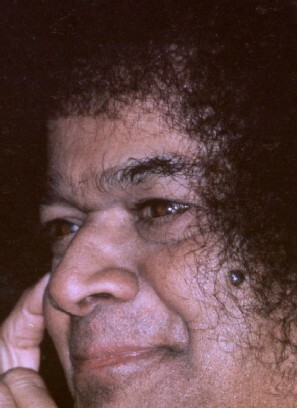 Swami Karunyananda, the life and soul of all service activities in the Godavari districts, who had discovered in Sathya Sai Baba the God that he had been seeking, was certain that devotees of Baba in the delta region of the Godavari would participate wholeheartedly to make the conference a phenomenal triumph. From every village, young men arrived at Rajahmundry before the new year. They put up pandals, levelled the grounds, dug drains and raised dining halls and kitchens, singing bhajans all the while. They filled the stores with provisions until Swami Karunyananda insisted on "no more" and many villagers returned disappointed and sad that their offerings could not be accepted in the pool. Women streamed into the kitchen and took up the task of preparing elaborate menus. Large quantities of milk, curd and ghee (clarified butter) arrived at the campus in buses reaching Rajahmundry town from every corner. The delegates were guests of the Godavari region and the hospitality bordered on worship. It was a revelation of the deep roots that the Sai message had taken in their hearts and how it had blossomed as love and service. Bhagavan's discourses helped integrate the office bearers into an effective instrument for the revival of dharma. He also blessed the Bal Vikas movement describing it as the basic activity of the Sai movement, and the gurus as its most useful pioneers. Bhagavan's presence during all the three days of the conference induced pilgrims to come to the Godavari from places as distant as Calcutta, Bhopal and Patna. On 3rd February 1974, Bhagavan visited the village of Kannamangala, about six miles from Brindavan. He announced that He had started a college in that region, so that students hailing from its villages could become leaders of the ideal of total revival and reconstruction which He called Janata-Kalyan (peace and prosperity for the people). He advised the students to revere the village and to live there with their kith and kin. "Encourage the formation of the Bal Vikas, the Seva Dal, the Mahila Vibhag and the Seva Samithi in your region," He said. The visit to Kannamangala was indeed historic, for Bhagavan has since visited more than ten villages in that area. He has renovated temples, provided shelters, expanded school buildings, tapped underground water and deepened existing water wells. He has helped promote literacy and has laid the foundation of moral reform by awakening the conscience of the people. Bhagavan has directed the 4000 Seva Samithis in India to adopt a village each and to serve its people with love and understanding. The old boys association of the Sathya Sai colleges, called 'The Kingdom of Sathya Sai', is shaping itself into an efficient and sincere instrument for continuing this seva (service) in the villages. Bhagavan's grace has reached the villages around Puttaparthi in the form of medical and educational facilities. "Cherish this vision of the emergence. Nourish the Ananda that now gushes in your hearts. I assure you that you have indeed been rendered immortal. You need not pass from birth to death again." No one in that mammoth assembly could have been the same when he rose and walked away. It took days of ministration by Bhagavan to send the longing, lingering devotees home. In 1974 Baba visited Bombay twice, in early March and in mid May. In March, He blessed a rally of 2500 Bal Vikas children, addressed a gathering of teachers from the university and various colleges, and inaugurated the extension projects of the Industrial Training School and the Agricultural polytechnic at Dharmakshetra. Speaking during the rally, He said, "Parents today are not competent to guide their children. They utter lies, accept bribes, indulge in gambling and spread scandal. They use foul language and boast aloud. Children must make elders ashamed of their habits." In May, He presided over the annual day of the Dharmakshetra school, and flew to the town of Ratnagiri in answer to the prayers of devotees there. On His way back from Bombay in March, Bhagavan spent two days at Sandur, in the Bellary District of Karnataka. He inaugurated one of the factories set up by the Raja Saheb to exploit the mineral wealth of that area. The Raja Saheb welcomed Baba, who had last graced the erstwhile kingdom 27 years ago. He related how, in 1949, when he gave up the reins of the state, Baba had assured him, "Don't worry. You will found an organization bigger than the state of Sandur!" And Baba had now come to bless that organization. The summer course in May-June was widely acclaimed as a must for young people who were about to confront the comedies and tragedies, the follies and frivolities of the human situation, for it strove to equip them with the knowledge of the sages and seers of every land, and bring them into contact with the Avatar of the age. On 19th June, two days before the close, Baba answered a question that was baffling analysts - Who is Sai? He revealed Himself in as much as our dull and dithering reason can accept. "I have come to unite all mankind into one family and to affirm and illumine in each of you your Atmic Reality... Do not crave from Me trivial material objects. Instead crave for Me, and you will be rewarded,"
He declared. No wonder! General Cariappa, former commander-in-chief of the armed forces of India, then called upon the thousand participants for three full-throated cheers of 'Jai Sai Dharma', which echoed all around. The Dasara festival commemorates the victory of the gods over the demons, of light over darkness, of knowledge over ignorance. So the thousands who throng to His presence are involved in disciplines which help them advance towards that victory. The women's college at Anantapur staged the play, "The Bishop's Candlesticks" and the boy's college at Brindavan (Bangalore) staged a Telugu play 'Pandava Vijayam' (triumph/victory of the Pandavas). Both plays were based on the sovereign cure that selfless love and devotion can effect. The Bhagavata Bhakta Samajam, a group of musicians and speakers drawn together by the bond of brotherhood and the common purpose of fostering 'the perennial philosophy of theism', and which holds three-day sessions of its activities comprising Vedic homa(ge), Puranic readings, devotional songs, folk dances, dramas and musical recitations, was affiliated to the Academy of Pundits by Bhagavan. They added many attractive items of educative and entertainment value. It was during the birthday festival in 1974 that Baba spoke strongly against the use and abuse of funds. He has always been against public appeals for money, and has warned devotees against both, asking for and giving such donations. He declared that nothing should be brought for Him, because He needed nothing. "Those who bring or advise others to bring, will be kept away," He said. "Women students and teachers must be very vigilant that they do not attract the eyes and tongues of men by their dress, movement, or behavior. Be a little behind in fashion, it does not matter; but do not outrage the traditions and conventions of our culture." On 29th August, the Birthday of Lord Krishna, the pages of the Bhagavatha [Bhagavatha Vahini] which describe His boyhood were re-enacted at Puttaparthi. The cows, buffaloes and camels, and also Sai Geetha, the elephant, were taken in procession from Prasanthi Nilayam to their new home, about a kilometer away. Rural pipes and drums led the line. 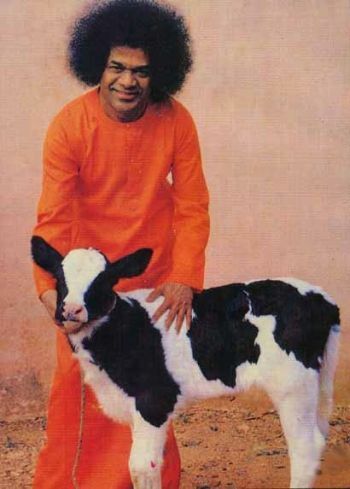 Sai Geetha followed in regal splendor, and the cows, with their attendant seva dal members, came next. Calves, frisking, jumping and butting, were held in check by the college students, while the immovable buffaloes stood and stared until they were pushed and pulled forward. Students of the women's college and others from Prasanthi Nilayam followed behind, singing bhajans. Sai Krishna was also there, with devotees singing around Him in joy. They had witnessed, three days earlier, another page of the Bhagavatha come alive. Incessant heavy rains had brought the Chitravathi into the village, and she swelled into swirling anger. Indra, the God of rain, appeared to cast his anger on the cowherd village again, but unlike as in the Bhagavatha days [see BV, chapter 38], this Krishna did not lift a mountain on His palm to shelter man and beast. He disappointed the peaks, by walking up to the open terrace of the east Prasanthi flats and cast a look at the turbulent waters seeking entry. That was enough. The flood began to recede steadily. During the Dasara festival Prasanthi Nilayam was quiet, except for a few extra ceremonies that the inmates were allowed to observe. For Bhagavan could not, in His boundless love, impose on the devotees, however eager, a ten-day stay Dasara and another ten-day stay on the occasion of the Golden Jubilee of the Advent, scheduled from 14th to 24th November.